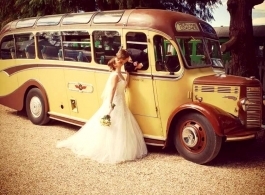 Vintage 1940's bus for wedding hire. This 1949 vintage Bedford is a very quaint, unique and most importantly practical mode of wedding transportation. Wit hseating for up to 29 passengers, this vintage wedding bus is great for taking bridesmaids, family, friends, guests etc to and from the wedding venue, the bride and groom also very often like to travel in this bus which is in immaculate condition and always driven by an experienced, smart and courteous driver. Also available for other events including proms, anniverseries, birthdays and any other celebratory occasion.